OK, so we’re not trying to make light of a serious issue, but we are, technically, homeless. A couple of days ago, our lawyer did the lawyer stuff, the real estate agents did the real estate stuff, and the new owners got the keys to their new house. Bankers then did the bank stuff, our mortgage was paid and the residual went to our checking account. So, we don’t own a house, we aren’t renting anywhere. We are homeless. The last shot of the house as 'our house'; Lisa had to sit on the front porch because there was no furniture. Unlike most homeless people, we are doing just fine. We won’t be sleeping under bridges, panhandling, dumpster diving, etc. any time soon. For the month of June, we are motoring around the UK, staying in quaint little bed and breakfasts, dining in Michelin-starred restaurants, and just generally decompressing after several stressful months of planning and prepping the move. The exact moment we became homeless was 12 noon MST, 1900 GMT, on June 10. At precisely that time, we were speeding down the A303 highway, about 20 minutes out of Salisbury.We had hoped to be in a pub where we could toast the sale, but Air Canada had different plans…so we did a quick fist-bump (Dan was afraid to take his eyes off the road! ), and toasted it at the Avon Brewery Inn a couple of hours later. Much of this trip is vacation; actually all of it is for Dan, but Lisa is presenting at 2 conferences. And we are also using the trip as a re-fueling mission, because when we get back, we will be scrambling again for a few days, then on a one-way flight to the land of Aus. And when we get there, Lisa starts work immediately. We are also spending some quality time with two close friends (H & J) before they depart on their own adventure in Alabama, USA. Our itinerary: Flying from Edmonton to London (the real London, where people don’t wear track pants) rent car and go to Salisbury, Oxford, York, Windermere, Stirling, Aberdeen, Edinburgh, and Manchester. It is our first time in many of these places (done the Scottish cities before, but not the English). And yes, we’ll finally get to experience Stonehenge; photos to follow in future posts. We no longer have an address, just a container number. Even though the house has still been ‘our house,’ for the last few days we have been staying with friends while our stuff was packed and loaded. The container is somewhere, probably sitting in the big freight yard between 99 St and Gateway Blvd in Edmonton. Some day, it will arrive in Sydney, be quarantined, bug bombed, checked for refugees, rabbits and catnip mice (sorry Malachi, we know you’ve been hiding your fav toys in your crate, but customs won’t like that!). Hopefully we will get our stuff by late August, and have somewhere to put it; when we finally arrive in Wagga on July 7, our ‘home’ for the first 10 days is The Lawson Motor Inn, courtesy of Charles Sturt University. It is a nice motel, with a large bedroom and a kitchenette (a refrigerator, kitchen sink and microwave), but it isn’t a fully-equipped home. We won’t be grilling ‘roo steaks there, unless they happen to have a barbie in the courtyard. The backyard birds didn't want to move with us, so we let them stay. The cats weren't given the same choice. Our quest for a home in Wagga will be a rental, for the short term; we’ve been told by our bank (we already have an Aussie account) that they won’t approve a mortgage for a few months, so we won’t be jumping into the housing market immediately. But we’ve spent a lot of time on www.domain.com.au, which is sort of like the Canadian MLS site, but including both sale and rental properties. Rentals in Australia (or at least Wagga) are done by realtors, who handle the transaction as the property managers. And though we have met, and engaged with, a real estate agent in Wagga, we will have to talk to a variety of agents in July; although an agent can sell anyone’s house, when a company has a listing for a rental, another company’s agent can’t rent it out. So it will be a matter of going office to office and seeing what is available. Part of our problem is that we need to have an address for much of our transition. The movers want to know where our stuff is going. The cat transit people want to know where to dispatch them on dismissal. The banks, both in Canada and Australia, want to know where we’ll be living. Canada Post needed to know where to forward our mail (kind of a moot point since they’re doing rotating strikes). Our friends want to know where they will be coming to visit (and we want you to know where to send the house-warming presents!). So, for now, our official address is Lisa’s office at CSU. We will have to change it again, later, but for now it works as a ‘home’ of sorts. Of course, given the hours Lisa puts in at work, she might as well ‘live’ at work… but no, that’s not what we’re trying to do here! And visitors probably won’t want to stay in her office, despite their being kangaroos on campus. 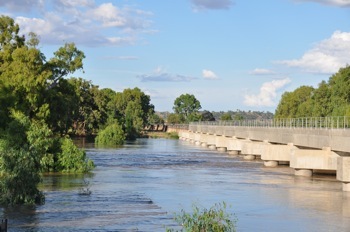 At least we won't have to live under this train bridge in Wagga; it was a bit flooded last time we were there. There isn’t much pre-arrival legwork we can do, either; according to our agent, renters only give 2 or 3 weeks notice on rentals. So, until we are in town, it would be hard to predict what might be available. Our agent did, however, tell us that we might have a bit of a tough time finding a house that allows cats – Aussie landlords, it seems, don’t like cats (insert spitting and clawing action here). Maybe we’ll have to point out that cats could best solve the mouse infestation in the Riverina; or, we’ll just introduce any potential landlord to Lester. No one could deny him a home. You may recall our earlier posting, where we wondered if Lester was the one who sold our home, with his endless belly displays. People in some countries live in abandoned sea cans. We could do that, except there wouldn't be room for us with all our belongings. The movers just managed to get everything stuffed in, with no room to spare. It needs to be cat friendly. Lisa wants two bathrooms (Dan is a bit of a pig). Dan wants a gas stove (electric just doesn’t meet his culinary skills any more). Lisa wants central heat (she gets cold easily); Dan wants central air (gets hot easily). Most of these requirements probably mean a newer house, but those are mostly away from the CBD, which is an appealing location. People keep telling us we need a pool (even though neither of us swim) because it does get hot in Wagga. We want a place we can garden. So many things to think about! The back yard was getting a bit scruffy by moving day. We hope that everyone who spent time here, eating and drinking, enjoyed those times as much as we did. We will graciously welcome you to our new garden when you come visit us in Australia. But for now, we are going to put these thoughts on hold and enjoy our homelessness. We’ll try to post pictures of some of our adventures as we travel around the UK. Stonehenge (at dawn!) is a good spot for photos, as is the place we are staying in the Lake District. We’re back in Canada for July 1st (how appropriate! ), where we’ll be sure to post a lovely tribute to Canada Day. Until then, stay tuned… we’ve got a few posts coming in the next few weeks. This entry was posted in Canada, Moving, real estate, Riverina, small town culture, wagga, weather, wine. Bookmark the permalink.